For 35 years the National Paddling Film Festival has been hosting an annual competition to determine the best in paddle sport videos and images and to support American Whitewater and river conservation. 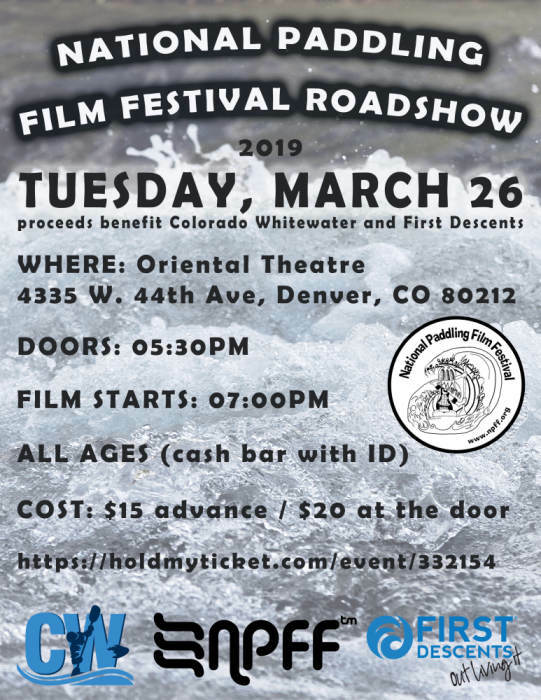 The Colorado Whitewater Association is hosting the National Paddling Film Festival Roadshow (Colorado viewing) at the Oriental Theater in Denver. 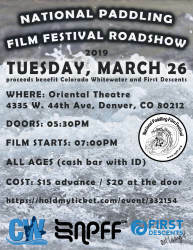 Event proceeds go to support two local non-profits, Colorado Whitewater and First Descents. Get stoked for the 2019 paddling season with several adrenaline-rushing, award-winning films! Cash bar and food trucks will be available, plus prize drawings and giveaways during intermission.